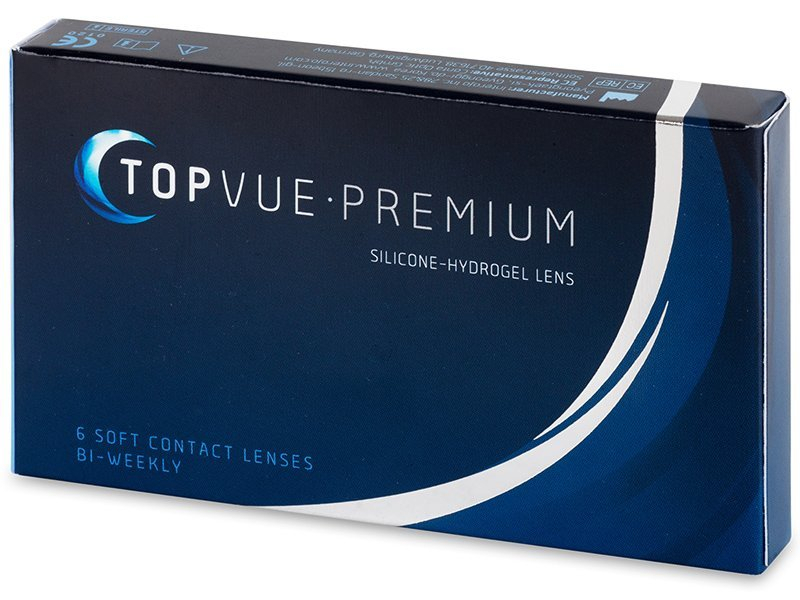 TopVue Premium contact lenses are bi-weekly contact lenses made from a new generation of silicone-hydrogel material, which has been modified to provide all-day comfort and clear vision. TopVue Premium bi-weekly contact lenses are made from a new generation of silicone-hydrogel material that has been specially modified to provide exceptional comfort while eliminating eye irritation as a result of dry lenses. TopVue contact lenses are produced with very thin edges to reduce friction between the lens and the eyelid when blinking. This reduced friction is an important factor for lens comfort. TopVue Premium contact lenses are fortified by added sodium hyaluronate during the production process. Sodium hyaluronate is a natural lubricating substance, and it is gradually released during wear to keep the lenses comfortable and prevent dryness. Sodium hyaluronate is a highly effective lubricating substance, and it has absolute compatibility with the physiological environment of the eye. Therefore, it does not cause any discomfort or undesirable complications, as may be the case for other wetting agents. This substance is completely natural to humans and can be found in body fluids such as joint fluid and the vitreous humour, the gel filling of the eyeball. 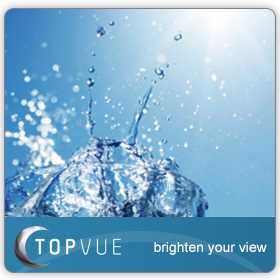 The innovative material of TopVue Premium features a high water content. This high water content combined with the gradually released sodium hyaluronate creates a uniquely effective hydration system. 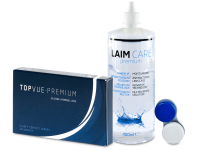 The hydration system helps keep the contact lenses moist and comfortable throughout the day. This technology also reduces deposits on the lens surface to keep your eyes healthy and your vision clear. The innovative technological processing of silicone-hydrogel materials provides TopVue Premium a high level of oxygen permeability by transporting atmospheric oxygen to the cornea through microscopic channels. The ability to transfer oxygen (transmissibility) is 104 Dk/t in TopVue Premium and the water content is 45%. Both the high breathability and high water content help TopVue Premium contact lenses supply the eyes with a sufficient amount of oxygen, which is an essential component for eye health and function. Hi, Hazel, Thanks so much for your recent comment and compliment! We do our best to make sure every customer is satisfied, so it is nice to hear appreciation for our work :) Please feel free to contact us if you need anything else! Tried these for the first time recently. They're easy to put in and feel good for most of the day. Very comfortable, and I notice an improvement over the monthly lenses. Good lenses, and you can buy with confidence with the return guarantee. Luckily I didn't need to use it! These lenses seem to resist dirt, etc better than others. Smog, dirt, etc doesn't bother my eyes quite so much with these. Must be a different material? No problems at all with these lenses. Cheap and comfortable, and that's all that matters. They have my recommendation. I ordered these lenses in the afternoon, and I had them delivered within 48 hours, even with Royal Mail. Excellent service all around, many thanks. Great service, cheap and fast delivery. I've recommended your company to friends, and they've all been just as pleased as I have. Many thanks. Always in stock and delivered promptly. Couldn't ask for anything better. I've been wearing these for about a month now, and I'm highly satisfied. Great quality for the price. I ordered these because of the return policy- just thought I'd give them a go. But their wonderful lenses. Very durable yet comfortable in the eye. I decided to give these lenses a go, and they're very comfortable. Your agent helped to expedite my delivery, so they arrived just before I left for holiday, which was wonderful. Great new product from TopVue. After switching from Acuvue, I'm very happy with these. Wonderful lesser-known brand, and truly comfortable all day long. Price cannot be beaten. Wonderful, quality lenses. My eyes have never felt fresher. I recommend these wholeheartedly. Switched from my previous user and highly satisfied.